Looking for a fun fall recipe for kids? 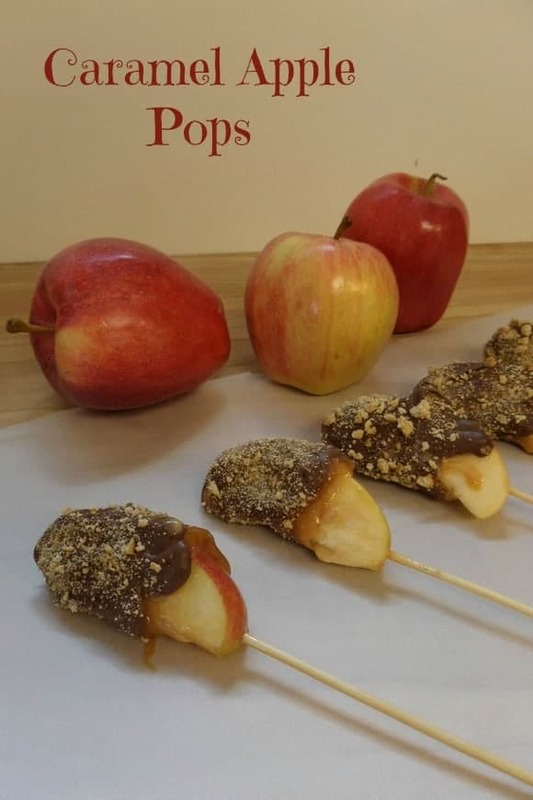 You’re going to love these Caramel Apple Pops!! When I think of fall, I think of an afternoon at the apple orchard or cider mill and that crisp fall air. It also makes me think of one of my favorite fall treats. Caramel Apples! I absolutely love caramel apples, but they’re hard to eat and usually big enough and sweet enough that eating one by myself is too much. Caramel Apple Pops are the perfect solution to that problem! Don’t forget to print the recipe card below. Careful cut and remove the core from your apples, leaving the skin on. The apples should be cut into large slices, each approximately 1/8th of the apple. Soak the apple slices in water and lemon juice for 10-15 minutes to prevent them from turning brown. Remove the apples from the water and pat completely dry with paper towel or napkins. Melt the chocolate candy melt in your microwave according to package instructions. 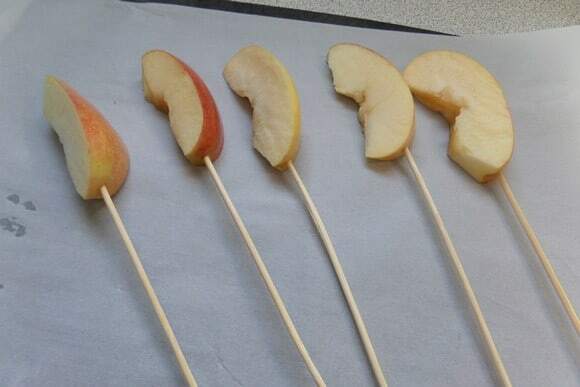 Carefully insert a skewer stick into each apple slice. 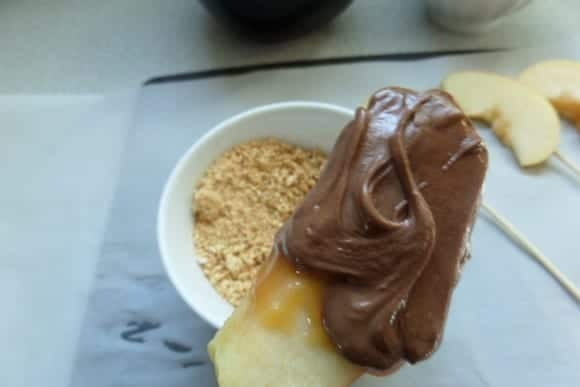 Spread a thin layer of caramel apple dip over the apple slice, covering approximately 2/3 of the apple. Cover the caramel with the melted chocolate candy melt and sprinkle the graham cracker crumbs over the still melted chocolate. Stand the apple pops in a glass or cup to let the chocolate harden. Once chocolate is hard, serve immediately or store in the refrigerator. While this treat is sweet, it is still a healthier alternative to many fall treats. The apple is nutritious and if you wanted to get creative, you could make a caramel apple bar and allow kids to make their own caramel apple with a variety of healthy toppings to choose from. 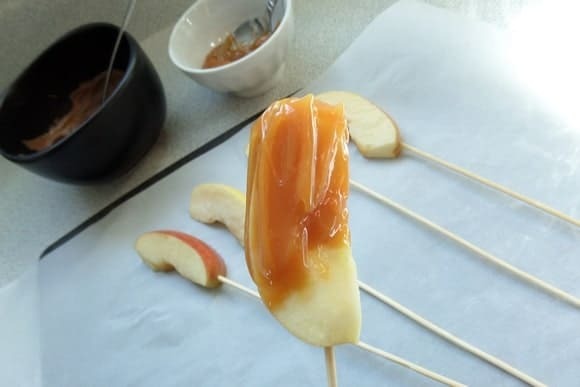 What is your favorite topping for caramel apple pops? Pregnant Again? Find Out What to Expect This Time Around! I made these the other day and the kids loved them. Only one didn’t want the chocolate on them. We added nuts instead of graham crackers. Oh yummy! I’m going to go do this right now with some nutella…. Great recipe to try with my son who loves to help out in the kitchen and it looks yummy too! These look so tasty and I bet they are a lot of fun to make with the kids! Definitely going to try them! OMG these are so neat!! My kids would really have a lot of fun with these, perfect for this time of year!! Oh man my kids would be all over this recipe! I think I will share it with them. They can do it themselves! These looks awesome, I never thought to dip individual slices of apples instead of the whole thing. We will be making these for sure. This looks like a blast to make and to eat as well! My grandkids would gobble these up! This looks like a really fun treat to make and eat! Thanks so much for this one the kids loved making and eating them! What a great idea! These would be a lot easier than doing the entire apple and there would be less wasted. I find when I do the entire apple often it all doesn’t get ate. Thanks for the idea! These look so yummy and such a great idea for children! These are just too awesome! I’d use some crumbled pecans as well…. A treat for the whole family, thanks for sharing! My kids would love these! Thanks for sharing. What a fun and tasty activity! YUMMY! These look SO good! I`ve got to make these with my grandchildren! I know they`d love them and also love making them, too! These look terrific! Super easy and easier to eat than whole apple caramel apples. Printing this out! Wow these look absolutely amazing I am going to try this tomorrow! I think it’s a good idea to just use slices. So much better than a whole apple. This is a great idea. I am having a kids birthday party coming up and I think I will make these pops. What a fun idea and so easy to eat! I can’t wait to make these with my girls. I love caramel apples and love the idea of doing this instead of the whole apple! Are Superhero Books Too Violent?